Whether we are working with an individual or institutional client, our firm goes to great lengths to ensure that we meet client needs and goals quickly, affordably and successfully. Our broad array of practice areas and years of experience distinguishes us from the others. 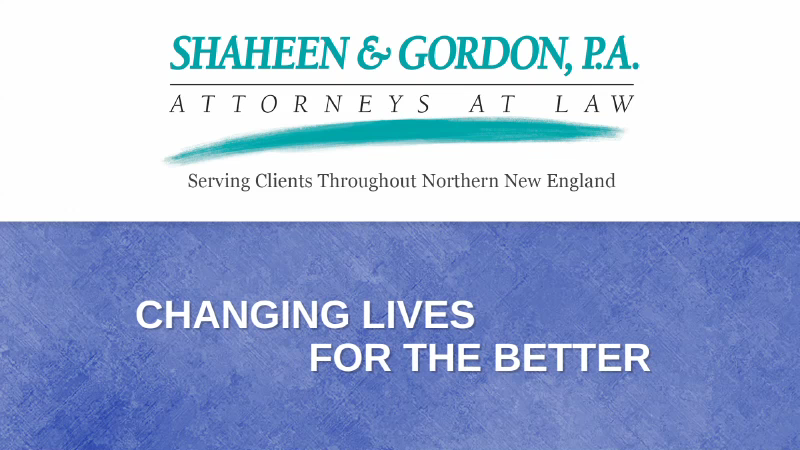 At Shaheen & Gordon, we apply the resources of one of New Hampshire's largest firms to each and every case we accept. This includes cases that are often handled by small offices and solo practitioners. Our dedication to our clients, years of experience and diverse practice areas permit us to apply the outstanding legal services and support in an efficient and cost-effective manner. We have grown through difficult times while others have faltered. Our success is no great secret -- we have attracted top legal minds to staff a wide range of practice areas. We believe in straightforward, honest and aggressive legal representation. We pride ourselves on crisp and clear communication with our clients. We work toward building positive relationships in courthouses and the business community. We work as a team, relying on one another to supply the quality legal advice to a wide range of issues. In turn, our reputation as a trusted source for legal counsel in New Hampshire and Northern New England grew. We are proud of the reputation that we have earned and work in every case to live up to our commitment to excellence. Our track record of delivering consistent results for our clients has been recognized by the community and the bar. As a consequence, our firm has grown and so has our ability to serve the needs of a dynamic client base. Shaheen & Gordon, P.A. now stands as one of the largest in the State of New Hampshire and we have our clients to thank for our success. From case preparation to trial presentation, to investigations and expert witnesses, to mediation and out of court resolutions, our firm navigates complicated legal matters quickly and successfully. This is possible because we have immediate access to some of the strongest legal tools and professionals in the industry, period. Thorough, detailed case preparation is perhaps the most important element to achieving successful outcomes. Our unique blend of human resources allow our team to quickly and fully size up legal, practical and factual issues, manage investigative resources and engage in pretrial litigation and trial preparation in a time-sensitive and cost-effective manner. Throughout the process, our lawyers work alongside our clients to identify goals, fashion a strategy and chart a course toward securing a successful outcome. We are committed to ensuring that our clients receive the attention and efforts of the best legal minds, tools and strategies in the industry. We have also developed a broad network of professional, legal and community connections that permits us to apply a comprehensive approach to addressing client concerns. This means that we are flexible in developing an approach to address thorny issues when they arise, giving our clients options for thorough, speedy and effective case preparation. Technology now plays a critical role in case preparation. We make it a point to rely on technological advances in the legal industry to support and present our cases in a number of forums. Relying on such resources, we churn through even the most voluminous of document productions to bring order to complex matters. We prepare impressive presentations tailored for courtrooms, board rooms and community leaders. Taking advantage of technology has played a crucial role in allowing our firm to obtain favorable and timely case outcomes. Just as technological advancements have revolutionized the abilities of the general public, they have also streamlined and strengthened the legal process. The ability and power to utilize these options, sets us apart from other firms. No case or client is the same. We know that our experience counts, but our success can't be measured by past results alone. We rely on our decades of experience, legal skills and depth of human and technological resources to be a formidable legal opponent and an indispensable asset to our clients. Our tenacious and creative legal representation is essential to securing successful results. Our attorneys understand that every client surfaces with unique goals and separate concerns and that there is no single answer that addresses any issue. Believing that there is more than one approach, we take the time to spot issues, communicate concerns, assess risk and reward, advance strategy and regroup when the unexpected occurs. To be effective as a lawyer is to be nimble, willing both to charge hard toward trial, while sizing up ways to avoid the risk of a contested case. In business matters, we take the time to take the temperature of the community or constituency impacted by any potential next step and fashion client advice that accounts for the real world impact of strategic planning. By being flexible and firm, unique results regularly address the needs of our clients. None of our resources would mean anything if it weren't for the fact that we approach cases on a deeply personal basis, prescribing and applying the correct tools to personally tailor legal strategies. At the end of the day, every case and client is unique, and a well-prepared firm with a deep pool of resources can handle varying matters effectively. If you would like to learn more about how our firm's resources can benefit your unique legal issue, contact Shaheen & Gordon, P.A. today.